Earlier this month at the 58th Annual Meeting of the American Society of Human Genetics in Philadelphia, researchers reported the results of two genome-wide genetic analyses, identifying five significant loci that contribute to autism susceptibility, three of which have not been reported previously , as well as a novel association of genetic variation on chromosome 5 with autism . Today, one in 150 children is diagnosed with autism. In fact, more children will be diagnosed with autism this year than with cancer, diabetes and AIDS combined . Autism is a brain development disorder that impairs a person’s ability to communicate or interact socially. The disorder is associated with restricted and repetitive behavior. While there is no cure for autism, with appropriate treatment and education, many children can learn and develop. The genetics of autism are the focus of much study, as it is unclear whether the disorder is due to rare mutation(s) or multigene interactions. In 2007, the Autism Genome Project Consortium evaluated 10,000 single nucleotide polymorphisms or SNPs in 1,181 families that had at least two autistic individuals . SNPs (pronounced “snips”) are DNA sequence variations that occur when a single nucleotide — A, T, C or G — in the genome is changed, producing different alleles (meaning sequences that code for the same gene). These small variations in DNA sequence make up almost 90% of all human genetic variation. Genetic linkage: occurs when particular genes are close enough together on a chromosome that, even with meiotic DNA recombination, tend to stay together. Copy number variation: the difference in copy number for segments of DNA between two or more individuals. The proportion of genetic diseases caused by copy number variation is thought to be substantial. The consortium study, using genetic linkage and copy number variation analysis, highlighted a region of chromosome 11 tightly linked to a gene called neurexin 1 (NRXN1), which encodes a cell surface protein found in neurons that contributes to glutamate synapses. Although the result was intriguing, it failed to meet genome-wide significance, scoring just below the threshold (4.03 versus 4.1). Now, researchers at Johns Hopkins University, the Broad Institute of Harvard and MIT and the Institute for Juvenile Research at the University of Illinois at Chicago, have used more recent SNP technologies to profile 500,000 SNPs in 802 affected sibling pairs; 50x the number of SNPs as the 2007 consortium study. They performed family-based linkage analysis  and an association analysis to examine the role of common variants . 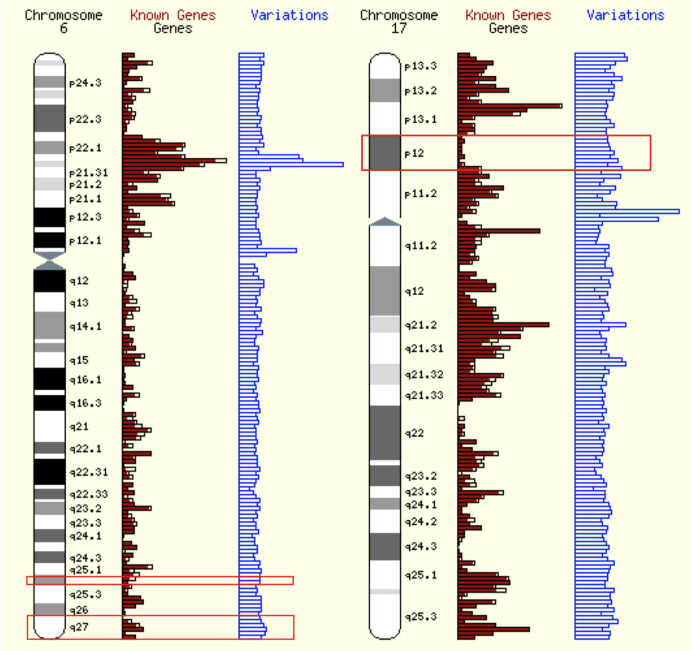 The scientists identified five genomic loci of significant linkage, three of which have not been previously identified; two at the end of the long arm of chromosome 6 (6q25.2 and 6q27) and one near the centromere (meaning the region of DNA typically found near the middle of a chromosome) of chromosome 17 (17p12). The SNP data set was also combined with a smaller National Institue of Mental Health (NIMH) autism sample to perform familial association mapping in 864 complete families . Utilizing additional SNP microarray follow-up data and genotyping top hits revealed an array SNP on chromosome 5p15 that was transmitted less often than expected from parent to autistic offspring. The researchers argue that the allele likely confers some protection against autism . A likely candidate for the allele is the gene semaphorin 5A (SEMA5A), which is in the genomic region and is involved in axonal (i.e. nerve fiber) guidance during neural development. The scientists assayed brain slices from 20 autistic individuals (compared to 10 controls) and found reduced SEMA5A expression, further implicating a role in autism . SEMA5A has been suggested by others to be a candidate gene in the etiology of autism. A 2006 gene expression study of six subjects with autistic disorder compared to healthy controls identified SEMA5A downregulation in blood samples . For additional information on autism, visit Autism Speaks, an advocacy group that promotes autism research and improved public awareness about autism. The familial association mapping study is compelling because it utilized genomic data, focused in on a target gene and validated the difference between autistic and control samples biochemically. Even more striking is the involvement of SEMA5A during neural development. These are the types of studies that will identify the molecular basis for autism and help us to better diagnose and treat the disorder. Arking et al. A large-scale high-density linkage study of autism identifies multiple genome-wide significant loci. American Society of Human Genetics. 2008 Nov 15. Weiss et al. Genome-wide association mapping in multiplex autism families. American Society of Human Genetics. 2008 Nov 15. Facts about Autism. Autism Speaks. Accessed 2008 Nov 22. Autism Genome Project Consortium. Mapping autism risk loci using genetic linkage and chromosomal rearrangements. Nat Genet. 2007 Mar;39(3):319-28. Epub 2007 Feb 18. New autism loci discovered. The Scientist. 2008 Nov 12. Melin et al. Constitutional downregulation of SEMA5A expression in autism. Neuropsychobiology. 2006;54(1):64-9. Epub 2006 Oct 5.